So cute!!! I feel dumb asking but what kind of vinegar? Mom never made Gingerbread cookies. I don't even think I knew about them until I was older and people I knew talked about their traditions of decorating them. From that time on I kidded Mom that the fact I turned out the way I did was because she never made me Gingerbread cookies . . . great oral Gingerbread tradition came out of this. What a fun tradition! 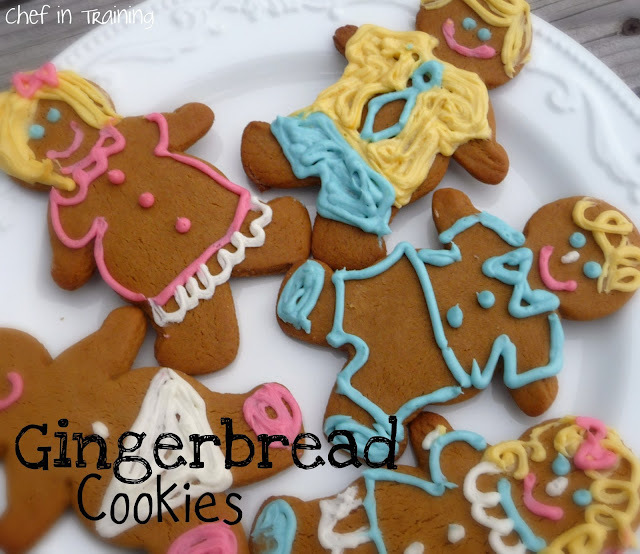 I love gingerbread and can't believe I have never made these! This looks like a great recipe. Thanks! My sister who is the creative one in our family use to make these as ornaments to hang on her Christmas tree each year. It was torture going to her house and smelling her yummy cookies and not being able to eat them. Your blog has inspired me to make my own. Wish me luck! Your cookies are adorable! These are perfect for Christmas! Have a lovely day! I made these today and they were SO yummy! They went on plate for neighbor gifts after I saved one out for each of my kids. Boy were they ever sad to see them go bye, bye! Is this an original recipe?